Five(5) persons, including a physically challenged man, have been arrested by the Sege District Police Headquarters for allegedly peddling narcotic drugs at Sege and its environs. 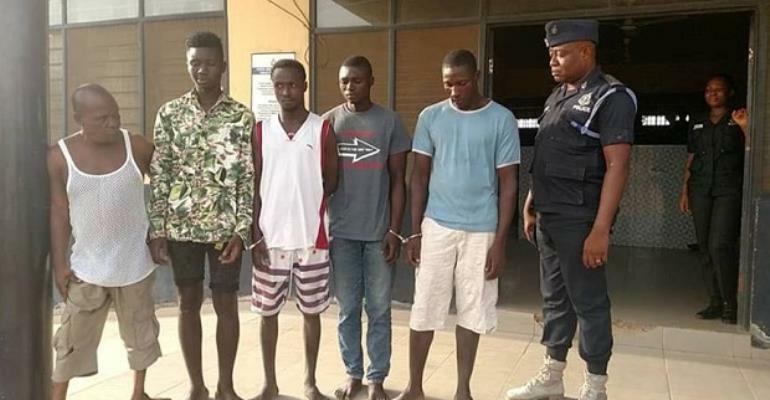 Apart from the physically challenged man, Emmanuel Sorgbordzor, popularly known as Alale, the other suspects are Iddrisu Hamidu, 25, Evans Doku, 21, Emmanuel Amenyo, 20, David Amatey, 19. Compressed parcels of dried leaves suspected to be Indian Hemp were retrieved from the suspects during the swoop by the police on Sunday. The police said the hideout of the suspects has become a den of criminals where numerous armed robbery, burglary and murder cases had been recorded. Recently, a number of people, including a commercial motorbike operator, commonly called Okada operators, have been gruesomely murdered under bizarre circumstances in the Ada West District, according to the police. During a media briefing, the Sege District Police Commander, Deputy Superintendent of Police (DSP) George Aboagye, explained that the police undertook the exercise based on information received from the public regarding the activities of the 'limping' man. He said that the police mounted surveillance that led to the arrest of the five suspects at Nalogbanya, a suburb of the Sege in the Ada West District of Greater Accra Region.